02/26/16 – Update v6.7 Scythe DLC, 10 Players, and Scripting Overhaul! 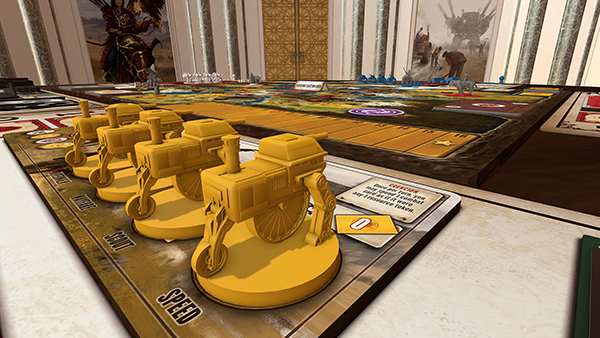 Our latest DLC Scythe is now available! 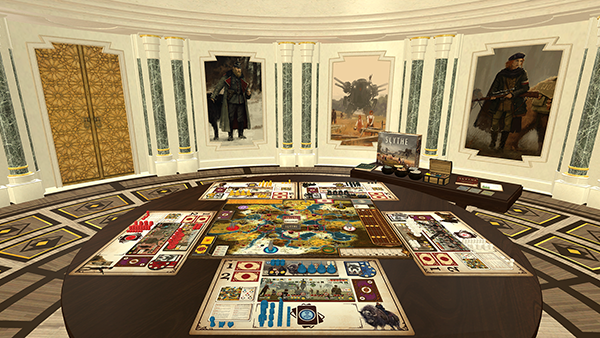 Scythe, by Stonemaier Games, is a gorgeous board game set in an alternate-history 1920s period. It is a time of farming and war, broken hearts and rusted gears, innovation and valor. The physical copy can be pre-ordered on their website. In other exciting news, we now have support for up to 10 players! Yep you heard it right, 10 players! By default only the Custom Rectangle table supports 10 players, but you can use any table by creating Hand Zones. Keep in mind when hosting whether your computer and connection can handle 10 players. If you had problems with 8 players, then most likely 10 won’t work for you. Scythe is now available for $7.99 with a 20% discount for the week. Available for 1-5 players and approximately 115 minutes of gameplay. When hovering over objects, be sure to leave it there longer to get the full description as there is a lot to read through. Start in the middle of the table where the Faction Selection Cards are. Hover over it to read more. The rulebooks can be found on the side table. The reference guide is available in multiple languages. Scroll through the pages to find your language. 2 seats have been added to allow up to 10 players. The new colors are teal and brown. All pointers have been updated with the new colors. Color wheel has been updated with the new colors. Only the custom rectangle table allows 10 players by default. You can use the Hand Zones to create hands on other tables. The more players, the more bandwidth that will be used, so use discretion when hosting. Lua script API has overhauled to an object oriented approach. See Blackjack example on the Workshop. Overall API cleanup for improved consistency. New functions added to the API. Object and Global API unified (only ‘self’ is unique to Object scripts). Removed redundant function calls (all the ForGameObject). Added a save and play button to the script editor for improved iteration times. Improved debugging with line number and object occurred on. Auto run checkbox to stop scripts from automatically firing after loading. Scripting can now be turned off in the host options menu. New chat command /clear to remove all chat messages from that tab. Optimized Lua calls to generate less garbage collection. Fixed rotation issues on scripting buttons. Added resizing for the scripting editor. We are working on updating the Scripting pages in the Knowledge Base (in progress). Fixed issue with scripting button not being created on clients machines all the time. Fixed issue with SetSmoothRotate(0,0,0) not working in Lua. Fixed issue with Lua SetRotation not working. Fixed many other bugs and issues with scripting. Added resizing to the Notebook window. Notebook has been updated with the new colors. Spectators can no longer see the different pages in the Notebook, just the rules tab by default. 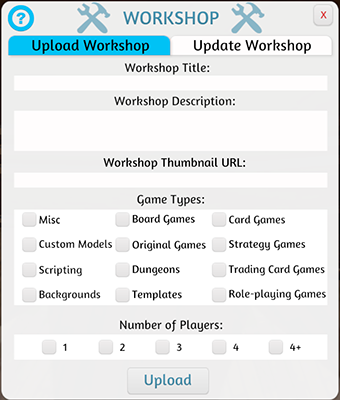 Revamped Workshop import/update menu so they now match the rest of the UI. Stacked objects no longer offset from mouse when picked up. Improved deselect object on search so it doesn’t mirror actions onto it. Added highlight around Zone dragging for improved visibility. Optimized autosave to reduce stutters, especially when using lots of states. Vector paint ‘delete all’ button now gives a yes/no prompt. Increased the camera max distance. Custom Model now has the option to toggle off casting shadows. Fixed issue where the client’s search icon was not cleaning up on bag searching. Fixed issue where the notebook menu tabs would clump when loading 2 default games in a row. Fixed issues with black meshes in certain scenarios. Fixed issue with the Workshop upload field being empty. Fixed the game name for Cosmic Encounter showing up incorrectly in the Server Browser.